Whether you’re new to the kitchen, want to sharpen your culinary skills or just want to have a fun night out with your spouse or friends, we have the cooking class for you at our Salud! Cooking School. Join us for demonstration, hands-on cooking, and wine classes, led by our own in-store instructors as well as some of the area's most exciting chefs, artisans and authors. Our instructional kitchen offers affordable, recreational culinary education for all ages. We are located on the 3rd floor of Whole Foods Market Charlotte, 6610 Fairview Rd. Charlotte, NC. GIVE THE GIFT OF A FUN COOKING EXPERIENCE! Salud! gift certificates are available in the amounts of $45, $65, $125, and $130 by visiting the Customer Service desk or by calling the Salud! kitchen at (980) 213-2096. Please make sure to ask for a Salud! gift certificate and do not purchase a Whole Foods gift card to be used for classes. All classes include recipes or a class lecture packet, servings of each recipe prepared (to be consumed in class - no doggie bags!) and up to two glasses of wine or beer. Seating and enrollment are on a first-come, first-served basis. 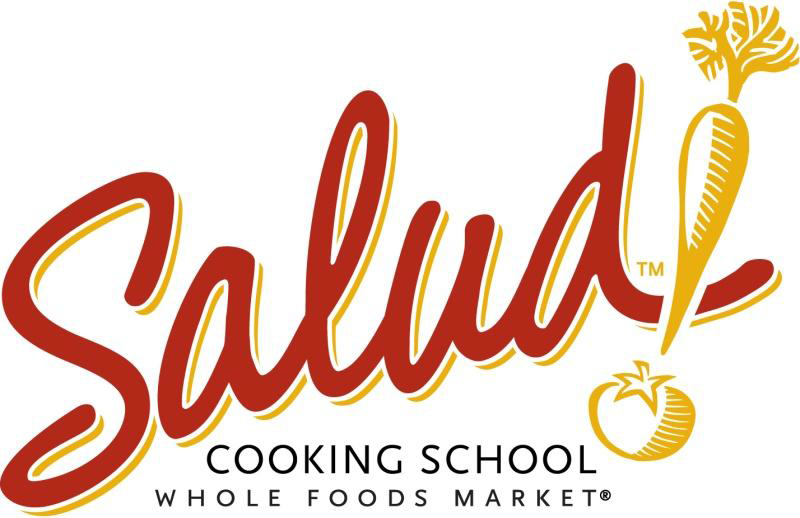 If a class is sold out, please send us an email at sharonrd.salud@wholefoods.com to be placed on our waiting list. With some exceptions, registration closes 48 hours prior to class. Payment is made at the time of registration. Be prepared to cook! Please remember to wear flat, closed-toe shoes, long pants, and comfortable clothing. Long hair must be tied back. Aprons and towels will be provided for your use in class. Students are divided into groups at the discretion of the instructor. Toward the end of class, you will be seated to enjoy your meal along with wine. Classes are limited to 12 students ages 18 and older unless noted otherwise; students ages 16 and older may attend with a registered parent or guardian. Relax and watch us do the work! You will be seated throughout the class and encouraged to ask lots of questions. Tastings of each recipe are served typically as they are prepared (to be consumed in class - no doggie bags!). Classes include up to two glasses of wine or beer. Classes are for students ages 18 and older unless noted otherwise; students under age 18 may attend with a registered parent or guardian. If you have certain dietary needs, please e-mail us before registering for a class so we can give you advice on which class will best suit your needs. sharonrd.salud@wholefoods.com Not all classes or dishes will be able to be altered. Kids and teens should wear flat, closed-toe shoes and comfortable clothing. Long hair must be tied back. Students are divided into groups at the discretion of the instructor. Students are seated at the end of class to enjoy the meal they have prepared. Classes are limited to 12 students unless noted otherwise. You will be seated throughout the class and encouraged to ask lots of questions as you taste each wine or cheese. We recommend arriving 15 minutes prior to the start of class. And come HUNGRY, you will be served a lot of food to be consumed in class. Classes may only be rescheduled a total of two times. After that, a new registration will be required. ***Although we make every effort to avoid changes to our class schedule, Salud! reserves the right to cancel any class due to low registration, make menu changes or substitute instructors in case of an emergency. For safety reasons, we are not able to rent our kitchen for a meeting space or non-cooking related event. Give the gift of cooking! For the cooks in your life there's no better gift than gift certificates to Salud. Gift certificates never expire and can only be used toward the purchase of a class at the Salud! Cooking School at Whole Foods Market Charlotte.Please email sharonrd.salud@wholefoods.com, or call (980) 213-2096 to purchase. To redeem gift certificates, please e-mail sharonrd.salud@wholefoods.com with your name and class choice as we need to place you in the class internally. Receiving a gift certficate does not secure a spot in a specific class. If you received a plastic gift card to Whole Foods (not specifically to Salud! ), you still need to e-mail us at sharonrd.salud@wholefoods.com to be placed in a class. There is no way in our registration system to use the gift cards to pay for classes. Receiving a gift card does not secure a spot in a specific class. Volunteers assist the chefs during classes with setup, class needs, and cleanup. In turn, volunteers earn points to take free classes at Salud (and get to learn a bit as you go!). To start volunteering, visit our volunteer website and fill out a registration form for an "adult student". You will receive a welcome e-mail from us with more information. Once you complete one training shift, you can sign up for volunteer shifts on our website and you'll be on your way! WEEK 2: 6/24/19 – 6/28/19 AGES 10-12 - SOLD OUT! WEEK 3: 7/8/19 – 7/12/19 AGES 10-12 - SOLD OUT! WEEK 4: 7/15/19 – 7/12/19 AGES 13-18 - 1 SPOT LEFT! Instruction is specially tailored for your child's age group so please sign your child up for the appropriate week! This summer, kids and teens are invited to tie on an apron and join our chefs in the kitchen! Students will recreate dishes from popular summer vacation destinations and then sit down to enjoy their creations. They'll have fun and leave with the confidence to make flavorful meals and snacks at home. Using the highest quality, freshest ingredients, students work in teams with our chef instructors to learn valuable cooking skills to last a lifetime. Students will love showing off the fruits of their labor as they host an invited guest to a feast on the last day of camp. Students may invite one guest to the Friday lunch; guests are asked to arrive at 1 p.m.
For safety, participants are required to wear flat, closed-toe shoes and long pants. Long hair must be tied back. Classes are limited to 12 students ages 18 and older unless noted otherwise; students ages 16 and older may attend with a registered parent or guardian. THIS WEBSITE IS NOT UPDATED IN REAL TIME. SOME CLASSES MAY ALREADY BE SOLD OUT WITHOUT BEING LABELED AS SUCH. e-mail sharonrd.salud@wholefoods.com with your name and number in your party to be placed on the waitlist. Do you love the thrill of competition? Are you hooked on watching every TV reality show that pits chef against chef? Salud! Sliced is a live cooking competition between two Charlotte-area chefs where each chef will have to create an appetizer, entrée, and dessert each using a mystery basket of ingredients. All ingredients in the basket must be used, and the audience will judge based on taste, plating, and creativity. At the end of the competition, votes will be tallied and one chef will be crowned the Sliced champion. Salud! chefs will commentate during the competition to highlight techniques being used and give sneak peeks at what the chefs might be concocting. You never know what’s in that mystery basket, so the possibilities are as endless as the chefs’ creativity! Book early as this event has proven to be quite popular! · Due to the improvisational nature of this event, no food accommodations can be made. You don’t have to leave the country to experience different types of cuisine, just visit Salud to teach you the cuisine of the Pacific Northwest. This melting pot of the USA includes many different types of cuisines influenced by people from all over the world interspersed with wonderful produce, fresh seafood and even coffee! For safety, participants arerequired to wear flat, closed-toe shoes and long pants. Long hair must be tied back. RESTAURANT REMAKE: PERUVIAN ROTISSERIE CHICKEN - SOLD OUT! Wit locations all over Charlotte the Peruvian Rotisserie Chicken has firmly established itself as a staple here in the Queen City. Come learn some of the secrets and recreate these delicious dishes at your house. CREOLE CUISINE - 2 SPOTS OPEN! DATE NIGHT: NIGHT IN NOLA - SOLD OUT! Whisk your sweetie away to Nawlins for a night you’ll never forget. This menu will make you feel like you visited the Big Easy without the pesky travel! MENU: Po’ Boy Sliders; Grilled Okra; Shrimp and Sausage Étouffée; Cajun Rice; Bacon Praline Bread Pudding. DINNER AND A MOVIE: CHEF - SOLD OUT! Hollywood’s newest “foodie” movie is packed with some great menu items. You don’t have to start your own food truck to enjoy these movie inspired plates. MENU: Carl's Got His Mojo Back Cubanitos; Food Truck Fries with Cuban Chutney; Molly's Zucchini Aglio Olio; El Jefe’s Skirt Steak with Martin's Salsa Verde; and Percy’s Big Trip Beignets. WEEKNIGHT WAKEUP: SOUTHERN CHIC - 3 SPOTS LEFT! Do you love recreating classic dishes to bring them to new heights? We certainly do. We’ll show you how to use swanky ingredients to add a little class to your favorite dishes. A little goes a long way, so you won’t have to break the bank to take your next event from downtown to uptown. BUTTER, BACON & BOOZE - SOLD OUT! Three of our favorite ingredients are highlighted in this indulgent menu. The three B’s of cooking are sure to bring flavor to any dish. After this class, you can take one, two, or all three of these ingredients and bring your cooking to a new level! MENU: Prosciutto Gruyere Puff Pastry Pinwheels; Bacon Balsamic Brussels Sprouts; Parisian Gnocchi with Sage Brown Butter; Drunken Steak; and Bourbon Bacon Chocolate Chip Pie. TGIF! FIESTA MEXICANA - SOLD OUT! Head south of the border and celebrate Cinco de Mayo with Salud! There won’t be a mariachi band, but there will be some delicious Mexican specialties. Andele! Andele! MENU: Chorizo & Potato Tostada; Frijoles Negros; Cumin Scented Rice; Tacos al Pastor; and Churros with Chili Chocolate Sauce. TEEN BAKING: SOUTHERN SPRING DESSERTS (teens only, ages 13-18) - 3 SPOTS LEFT! As you move closer and closer to your college years, learn the skills you need to bake just like mom on your own. Impress your friends and family with your totally cool baking ability. You’ll never buy cookies from a tube again! DATE NIGHT: CANDLELIT STEAKHOUSE DINNER - SOLD OUT! Bring the experience of a fancy steakhouse dinner out into the comfort of your own home. In this class, you'll learn all the tips and tricks used by chefs to turn your food up to five stars. All you need to do is light the candles! RESTAURANT REMAKE: MEDITERRANEAN CAFE - 1 SPOT LEFT! The Mediterranean is known for its exquisite climate, culture, and cuisine. Learn how to prepare a variety of Mediterranean dishes, incorporating new spices and cooking techniques. This menu will spice up your ordinary weeknight! MOMMY'S LITTLE HELPER: COOKING FOR MOMMY(1 registration for one parent and one tot ages 3-6) - SOLD OUT! At Salud!, we believe getting kids involved in cooking at an early age fosters a love of cooking throughout their lifetime. In this class, we'll learn some basic cooking skills to make meals you and your child can enjoy! Nothing is more fun than cooking together. Ever want to learn the secrets of making the perfect sushi roll? After this class, you'll be able to create your own stunning sushi dishes in your own home. We'll make a variety of rolls and side dishes that are sure to please every palate! MENU: Summer Rolls; Tempura Vegetables; Assorted Sushi Rolls; and Fortune Cookies. WORLD CUISINE: INDIAN – NEW MENU! - 4 SPOTS LEFT! Explore the mysterious tastes, textures and aromas of Indian cooking as you take an up-close cooking tour. In addition to cooking fabulously flavorful Indian fare, you’ll learn about the exotic and aromatic spices employed in Indian cuisine and discover some of the interesting ingredients that may be unfamiliar to Western palates. DATE NIGHT: SPRING FEVER(1 registration per couple) - SOLD OUT! Got spring fever? So does Salud! Bring your special someone to the kitchen to make some dishes sure to get you in the mood for warmer weather. Seasonal ingredients make an appearance in all of these stupendous spring recipes. MENU: Wild Mushroom and Scallion Tart; Beet Salad with Citrus Vinaigrette; Herb and Ricotta Meatballs with Spring Vegetable Tagliatelle Pasta; Lemon Tart and Lavender Whipped Cream. COOKING TOGHTHER: “BITE SIZED BAKERY”(ages 10 plus – 1 registration PER PERSON) - SOLD OUT!! At Salud!, we believe getting kids involved in cooking at an early age fosters a love of cooking throughout their lifetime. Join your child in this class where we'll learn some basic baking skills to make the goods you and your child can enjoy! Nothing is more fun than cooking together. SATURDAY NIGHT SOIREE: SWIG & SWINE - SOLD OUT! There are a number of classic wine pairings; Steak and Cabernet, Fish and Sauvignon Blanc. Now we'll create another, more Southern pairing: wine & swine! MENU: Grilled Grape Crostini with Aged Chévre and Serrano Ham; Veggie Slaw with Bacon and Pinot Noir Vinaigrette; Ham, Gruyere & Sherry Polenta; Sautéed Pork Chops with Apple Wine Butter Sauce; Chocolate Cheesecake with Cherry Port Sauce and Candied Bacon. BRUNCH IT UP: MIMOSAS FOR MOM - SOLD OUT! Treat mom to a special brunch experience…minus the hour wait! Mom will enjoy creating a delectable brunch complete with mimosas and memories with you. MENU: Mimosa Salad; Smoked Salmon Frittata with Savory Herb Scones; Mascarpone Stuffed French Toast with Strawberry Compote. WEEKNIGHT WAKEUP: CHINESE TAKE-IN - SOLD OUT! Ever wonder how to make your favorite Chinese dishes at home? Wonder no more. This class will teach you the ins and outs of making Chinese take-out in your own kitchen. No MSG allowed! MENU: Shrimp Egg Rolls with Sweet Chili Sauce; Sautéed Baby Bok Choy; Sesame Noodles; Bourbon Chicken; Chinese Doughnuts with Five Spice Caramel. Making your own pasta is surprising easy, and the results are delicious! And what's a pasta without a delicious sauce? We'll make some delicious and easy sauces that will make you feel like you stepped into an Italian trattoria. MENU: Fettuccini Carbonara with Peas Prosciutto; Whipped Feta Raviolini with Pesto; Herbed Gnocchi with Lamb Ragout; and Olive Oil Cake with Lemon Glaze. VEGAN SPRING SURPRISES - 3 SPOTS LEFT! This class will highlight all of the beautiful, delicate produce and herbs of spring and turn them into satisfying dishes. We’ve taken away the animal products, but left all of the flavor! FRIDAY WITH FRIENDS: AT THE CHARLOTTE FOOD TRUCK RALLY - SOLD OUT! With their innovative flair, pop culture allure, and culinary exploits, food trucks have become one of the restaurant industry’s most en vogue, recession-thumping trends. In many major cities around the country you can find a veritable food court of offerings, all along one street. In this class we’ll find out what makes these mobile culinary entrepreneurs so popular. Dream of crossing the pond and donning an apron in the baking tent? Don’t hop on a plane to make the baked goods of the British Isles, you can simply hop on down to Salud! We’ll show you how to make the scrumptious treats that are sure to make you star baker. Abundant with olives, seafood, and spice, Spain is a culinary destination not to be missed! If you can’t board a plane, fly down to Salud to revel in the flavors of España and learn how to recreate the flavors for your friends and family at home! MENU: Croquetas de Jamon (potato and Serrano ham croquettes); Citrus Olive Salad; Seafood, Chicken and Chorizo Paella and Churros with Spicy Chocolate Sauce. SLICED! LIVE COOKING COMPETITION - SOLD OUT! TWISTED TAPAS - SOLD OUT! Tapas are the heart of Spanish dining where everyone congregates together for good food and conversation. Join us as we make small plate creations from around the world. TV DINNERS: FRIENDS - 1 SPOT LEFT! Join us at Central Perk as we relive the iconic sitcom that defined the 90's. The "Rachel" hairstyle is optional, clapping in the theme song is not. MENU: Onion Tartlet; Inappropriate Interview Salad with Waiter’s Pocket Breadsticks; Monica’s Lasagna; Joey’s Pocket Fork Cheesecake. COOK THE BOOKS: GIADA’S ITALY - 1 SPOT LEFT! Do you love to pronounce Spaghetti with the two t’s? Then this class is for you! We’ll recreate some of Giada’s most delicious recipes from her trips to Italy. Buon Appetito!! MENU: Crab Arancini, Beet Goat Cheese and Arugula Salad, Roasted Potatoes Carrots and Brussels Sprouts, Roman Style Chicken, Citrus Crostata. DATE NIGHT: MEAT YOUR MATE (1 registration per couple) - SOLD OUT! Is your favorite vegetable meat? Then this class is for you. Come enjoy our meat centric menu! We'll show you many ways to prepare meat that you can cook for your next date or just for yourself. Jump-start your cooking skills in this class where we will teach you how to care for your knives and use them skillfully, safely, and efficiently. You will learn many classical knife cuts, their dimensions and their uses. Afterwards, you'll sit down and enjoy the meal that you prepared with your beautifully cut ingredients. Students are requested to bring a chef's knife (8-inch or larger, not serrated - example below) to class, but house knives will be available for use as well. MENU: Field Green Salad with Dijon Vinaigrette, Tomato Soup, Sautéed Chicken in Pan Sauce with Roasted Vegetables, and Vol au Vents with Fruit Compote. SATURDAY SUPPER CLUB: DIM SUM DINNER - 1 SPOT LEFT! Nothing is more fun than getting together with your friends and tasting many different small plates of China. This class will introduce you to some new flavors and cooking techniques to bring your next supper club to new heights. You don't have to be rich to throw a swanky and chic cocktail party. With these foolproof recipes, your friends will feel like they're rubbing elbows with the stars! MENU: Gruyere and Soppressata in Puff Pastry; Caesar Salad Spears; Parmesan and Thyme Crackers; Curried Chicken Salad Cups; and Peanut Swirl Brownies. Agreed upon by the majority of chefs as the most important ingredient in cooking, salt enhances the flavor of foods, can be used as a curing agent, and comes in all different forms. We’ll learn all about the many sides of salt! Four special wines will be tasted and each will be paired with a dish of the chef's choosing. Food and wine will compliment each other in an informative and enjoyable evening orchestrated by our wine department and Salud! chefs. GIRLS' NIGHT OUT: SMALL PLATES & SANGRIA - SOLD OUT! What’s more fun than getting together with your girlfriends and having a few cocktails and a couple bites to eat while chatting the night away? We’ll show you dozens of ways to make your girls’ night out a night to remember, from easy and delicious appetizers, to creating your party’s signature drink. GREAT BRITISH BAKING SHOW - 4 SPOTS LEFT! DATE NIGHT: SUMMER SCHOOL OF SEDUCTION (1 registration per couple) - SOLD OUT! The art of seduction has always included delicious foods. We'll make some sensuous and tempting dishes filled with aphrodisiacs that will surely light your fire. Greece is known for its translucent waters and spectacular vistas, as well as its exquisite climate and cuisine. In this class, we’ll learn how to prepare a variety of Mediterranean dishes with big flavors. Take your know-how home and share the wealth. It’s a popular saying, but here in Salud! we turn those lemons into delicious dishes with a bright and slightly tangy twist. You’ll be amazed at the many different uses of the almighty lemon. SUSHI WORKSHOP - SOLD OUT! MENU: Summer Rolls; Corn, Tomato & Edamame Salad; Assorted Sushi Rolls; and Fortune Cookies. In this class we'll use our grills in unexpected ways to create some different, even exotic dishes that go way beyond barbecue. MOMMY'S LITTLE HELPER: STRAWBERRY PATCH (1 registration for 1 parent and 1 tot ages 3-5) - SOLD OUT! At Salud!, we believe getting kids involved in cooking at an early age fosters a love of cooking throughout their lifetime. Nothing is more fun than cooking together. SATURDAY SUPPER CLUB: GETTIN' PIGGY WITH IT - SOLD OUT! We’re continuing our love affair with all things bacon, and we’re cooking up a perfect pig pickin’ party! MENU: Pulled Pork Egg Rolls; Baked Potato Salad; Bacon and Brussels Sprout Slaw; Sweet Tea Brined Pork Chop with Peach Salsa and Brown Sugar Bacon Whoopie Pies. Due to the improvisational nature of this event, no food accommodations can be made. Summer is the perfect time to taste the sea's bounty. Learn how to create succulent summery seafood dishes that are sure to please the palate. We often think of pasta as warm and comforting dishes, perfect for a cold winter’s day. In this class, we’re going to explore the lighter side of pasta. We’ll explore different types of pasta, make some pasta dough from scratch and cut it into fettuccini and ravioli. After making some fresh homemade sauces, and a light filling for the ravioli, you’ll be all set to enjoy the delicious dishes we prepare. MENU: Pasta all’Uovo; Ricotta Gnocchi with Fresh Pesto Sauce; Fresh Marinara Sauce with Herb and Mascarpone Filled Ravioli, Linguini with Carbonara and Peas; and Zabaglione with Fresh Berries. Starting with Careme, carrying on with Escoffier, and brought to America by Julia Child, French techniques are prevalent in the best restaurants in the world. French techniques may seem daunting, but in this class, you’ll learn ways to replicate them at home and turn your kitchen into a bistro. MENU: Niçoise Salad; Herbed Parisienne Gnocchi; Summer Vegetable Ratatouille; Sautéed Chicken with Herb and Wine Velouté; and Lemon Soufflé. Nothing says summer like a cookout with your friends in the backyard. This class will teach you ways to turn up the heat on your summer entertaining by putting some new twists on classic cookout foods. After this class, your house will be the destination for the all-out cookout!! Are you hip to the latest wine trend, rose? This versatile wine is the perfect summer sipper to pair with many foods and can enhance the flavor of dishes when used in cooking. You’ll be ready to hit the patio with a glass after this class! Salads are a staple of the summertime menu. These salads are light and tasty and sure to satisfy. We'll even make a dessert salad! Love this show so much you’re ready to move to the country and open up a restaurant? Don’t quit your day job just yet! Learn how to recreate some of the famous recipes featured on the PBS hit to satisfy your inner chef. It’s finally farm stand season again! In this class, we’ll create dishes that help to make the most of summer’s bounty. From strawberries, to zucchini, to watermelon. MENU: Watermelon Salsa Canapes; Grilled Pepper Panzanella; Sauteed Zucchini Ribbons; Grilled Chicken with Peach Chutney; and Strawberries with Cheesecake Creme. DATE NIGHT: HOT TAMALES (1 registration per couple) - SOLD OUT! Love is in the air! Or is it the humidity? Either way, it’s hot and we’re cooking up some Mexican dishes with a kick that you will help you fall in love with your hot tamale all over again! What is wine country cuisine? It's fresh, it's artistic, and it's often and incorporates a blend of cultures. Join us for a walk through wine country and revel in the simple and carefree cuisine of Northern California. MENU: Grilled Grape Flatbread; Shaved Snap Pea Salad; Herb Parmesan Risotto; Chicken a la Vendemmia (Chicken with Red Grapes); and Lemon Cake with Blueberry Red Wine Sauce. MENU: Bacon Crab Dip; Wine Kissed Rice Pilaf; Buttery Summer Succotash; Drunken Skirt Steak with Compound Butter; and Bacon S’mores with Bourbon Chocolate Sauce. Ready for the cookouts and BBQ’s that await the summer season? We’ll show you some new and exciting dishes to give your next picnic some pop! Love visiting the lake in the summertime? Let Salud! show you how to recreate the feeling and the food of the lake in your own backyard. Just fill up the kiddy pool, and you’ve got a party! Whether you’re meeting your buddies or looking to mingle with new friends, the Taqueria is the perfect meet-up spot! This class will teach you how to make all your favorite Mexican classics and hopefully help you make new friends. Set your heart aflame with an explosion of flavors. You and your date will create some yummy dishes that are sure to make your taste buds pop! MENU: Smoky Grilled Chicken Wings with Fire-Grilled Jalapeno Ranch; Red, White & Bleu Slaw; Smoked Paprika Potato Poppers; Exploding Burgers; Chili Chocolate Molten Cake. The show may be over, but you can still join the Office crew for a delicious meal full of wit and sarcasm. MENU: Bouillabaise Style Mussels with Grilled Crostini; Nicoise Salad with Grilled Tuna; Fougasse Flatbread; Fruited Tarte Tropezienne (Custard-Stuffed Cake with Fresh Fruit). At Salud!, we believe getting kids involved in cooking at an early age fosters a love of cooking throughout their lifetime. In this class, we'll learn some basic cooking skills to make your dinner dance! Nothing is more fun than cooking together. MENU: Yummus; Pork and Pineapple Skewers; Creamsicle Cupcakes. MENU: Scallops with Kate’s Saffron Sauce; Zoe’s Pasta Oreganata with Spicy Sausage; Nick’s Vegetable Sauté and Tiramisu. The wonderful and versatile avocado takes center stage in this class! Full of healthy fats and an unmistakable texture, the avocado isn’t ONLY for guacamole anymore. From the beaches of Brazil to the mountains of Peru, we'll take a tour of the South American continent's eclectic cuisine. We'll create a delicious array of dishes made from indigenous ingredients with European influence. MENU: Ostiones al la Parmesana (Baked Scallops with Parmesan) – CHILE; Causa de Camarones (Layered Shrimp & Potatoes) – PERU; Churrasco con Pebre Salsa (Steak with Cilantro Sauce) – CHILE; Feijoada (Vegetable Stew) – BRAZIL and Chocotorte (Chocolate Torte) – ARGENTINA. There’s nothing like a great night out at the local pizzeria with great friends. We’ll enjoy some delicious Italian-American comfort foods that are sure beat delivery any day of the week. Do you love your Southern sweetie? Bring them down to Salud! for a summery southern supper that will earn you the title of best sweetheart of the year. Teppanyaki cuisine is named for the large iron cooking surface on which steak, chicken and vegetables are sautéed. It’s delicious, healthy and usually very entertaining. MENU: Tempura Shrimp; Salad with Ginger Miso Dressing; Hibachi Rice; Steak & Chicken Stir-Fry; and Fortune Cookies. Everything's better with bacon, right? From appetizer to dessert, we'll add this salty, smoky star to every recipe. You'll fall in love with bacon all over again! Can’t coordinate schedules to take a trip? Grab your friends, hop in the car, put the top down and head for the Salud! instead. We’ll make you feel like you’re at the beach with some coastal favorites that will make you want to stay home all summer. MENU: Warm Crab Dip; Tropical Salad with Citrus Vinaigrette; Coconut Shrimp; Confetti Rice and Key Lime Parfaits. One of the fastest and most flavorful ways to cook is by using the wok. This class will teach you the ins and outs of using a wok as well as well as flavorful sauces and rolled delicacies on the side! MENU: Gazpacho Andaluz; Citrus Olive Salad; Seafood, Chicken and Chorizo Paella and Churros with Spicy Chocolate Sauce. COOK THE BOOKS: 101 ASIAN DISHES YOU NEED TO COOK BEFORE YOU DIE - SOLD OUT! Known for his appearances on Top Chef and Chopped, Jet Tila knows a few things about authentic Asian Cuisine. Combining his Thai and Chinese backgrounds, we’ll select 5 recipes from his new book. He promises that they will be better than takeout!! Join the chefs at Salud! for the hottest food from the steamy location of South Beach. This spicy and sassy cuisine will be sure to bring the feel of the Miami coast to your front door. Do you love when your food makes you sweat? Salud! does too. We’re using spicy foods from around the globe to wake up your weeknight slump and set your taste buds on fire. Warning: you may want to bring a fan! MENU: Sriracha Deviled Eggs; Spicy Sesame Slaw; Spicy Thai Peanut Noodle Salad; Spicy Korean-Style Meatballs; and Chocolate Chili Cupcakes with Cinnamon Buttercream. A burger can be one of the ultimate comfort foods. We'll get back to basics as we make the ultimate burger from the ground up. From the buns to the condiments, we'll make the homemade best of every element to create the Ultimate Burger! High in the hills of Italy, summer is spent with beef grilled over glowing coals and drizzled with olive oil, served with red wine and crisp summer vegetables. Tuscany is known for its simple and refined flavors for good reason. Students learn some of the ingredients, techniques, and history of Tuscan cooking as they enjoy authentic dishes from the region. Boungiorno! MENU: Fennel and Orange Salad; Grilled Vegetables with Balsamic Vinegar; Risotto alla Parmigiana; Florentine Steak; and Balsamic Berries with Lemon Basil Zabaglione. Do you burn water? Do friends have to explain how to use an oven? Do people run when you pick up a knife? We’ll start at the very beginning and introduce you to basic culinary techniques. Don't worry - we'll turn your food from garbage to gourmet. MENU: Salad with Blender Vinaigrette; Sautéed Vegetables; Rice Pilaf; Sticky Beer Chicken; and Chocolate Marble Bread Pudding. MENU: Pasta all’Uovo; Ricotta Gnocchi with Fresh Pesto Sauce; Grilled Marinara Sauce with Herb and Mascarpone Filled Ravioli, Linguini with Carbonara and Peas; and Zabaglione with Fresh Berries. Love is in the air! Or is it the humidity? Either way, it’s hot and we’re cooking up some heat lovin’ dishes that you will want to have an affair with! MENU: Crab and Artichoke Dip with Grilled Crostini; Lemon and Basil Asparagus Sauté; Warm Rice Salad with Pomegranates and Pine Nuts; Seared Scallops with Garlic Wine Sauce; Coffee Kissed Chocolate Mousse with Strawberry Whipped Cream. Jump-start your cooking skills in this class where we will teach you how to care for your knives and use them skillfully, safely, and efficiently. You will learn many classical knife cuts, their dimensions and their uses. Afterwards, you'll sit down and enjoy the meal that you prepared with your beautifully cut ingredients. Students are requested to bring a chef's knife to class (8-inch or larger, not serrated - example below), but house knives will be available for use as well. MENU: Salad with Dijon Vinaigrette, Tomato Soup, Sautéed Chicken with Lemon Cream Sauce, Roasted Vegetables, Roasted Potatoes, and Vol au Vents with Fruit Compote. Light a fire under the hottest vegetarian dishes to hit the grill. Both flavorful and craveable, grilled vegetarian foods take things to a higher level. There is a whole world of vegetarian-friendly food which adapts easily to the grill. You’ll be delighted with the unique flavor results. We’re taking favorite ingredients to the next level! If you’ve been to one of our butter, bacon, or booze classes, you’ll love this class even more. NOTE: All diets are off tonight!!! Four special wines will be tasted and each will be paired with a dish of the chef's choosing. Food and wine will complement each other in an informative and enjoyable evening orchestrated by our wine department and Salud! chefs. Nothing washes down great Southern food better than a cold beer! We'll pair some local flavors with some local brews. The newest food and wine pairing is pork with pinot noir. We’ll take both of these versatile ingredients and turn them into dishes that will make your tastebuds tipsy! The newest series to bingewatch on Netflix, Salt, Fat, Acid, Heat, is based on the fabulous instructional and inspirational book by chef and author, Samin Nosrat. Once you learn the four elements to good cooking and eating, you’ll never eat bad food again. Ever wonder how cheese is made? Wonder no more. During this class, you’ll learn the ancient art of cheese making and make some wonderful accompaniments to enjoy with the fruits of your labor. MENU: Mascarpone, Queso Blanco, Ricotta; Hand Pulled Mozzarella; Cherry Chutney; Spicy Strawberry Salsa; Hot Pepper Jelly; and Assorted Flat Bread Crackers. There is more to fire than just grilling. In this class, we’ll show you how to smoke, grill, flambee, and fire-roast. After tonight, you’ll be ready to throw a party that’s smokin’! One of the most popular challenges on Food Network’s Kids Baking Championship, dessert imposters is the trend of taking your favorite sweets and making them look like your favorite dinners! This class will be a treat for the eyes and the tastebuds. Calling all Parrotheads!! Summer isn't over just yet. There's time for one more trip to paradise filled with lots of great food, music and friends. MENU: Cheeseburger In Paradise Sliders with Cabana Ketchup; Lava Me A Pork Bowl with Saffron Rice; Shaker of Slaw; and Margarita Pie. One of Nashville’s hottest restaurants, Chaatable Indian Street Food, has a huge Instagram following for good reason. Although Ina Garten doesn't consider herself to be a "professional" cook, she has spent decades working with chefs and learning the techniques that take their cooking to the next level. In Cook Like a Pro, Ina shares some of her most irresistible recipes and very best "pro tips," that the Salud chefs will help you master! Come and learn all about the Mediterranean diet as we cook through a full day of meals. The Mediterranean diet showcases appetizing ingredients such as fresh fruits, vegetables, fish, and whole grains. You even get to enjoy that splash of olive oil and a glass of red wine! Now that's a diet everyone will love. Taking the family to a sushi restaurant can get quite expensive. After this class, you'll be able to create your own stunning sushi dishes in your own home. We'll make a variety of rolls and side dishes that are sure to please every palate! MENU: Corn, Tomato, Edamame Salad; Pineapple Chicken Teriyaki Skewers; Creamsicle Cupcakes. Since its already hot and steamy outside, why not let that influence our menu? These dishes have a little kick and a lot of flavor. MENU: Pork Belly Steamed Buns; Steamed Sesame Kale; Chorizo Mac and Cheese; Nashville Hot Chicken; Garam Masala Chocolate Cake with Chai Buttercream. It’s cool. It’s got a beard. It’s drinking Kombucha. It’s brunch. It’s TACO TUESDAY! But we’re turning the traditional taco upside down (not really) and making some new and exciting versions that will certainly spice up your weeknight! MENU: Roasted Sweet Potato Tostada; Southern Fried Chicken Taco; Asian Pork Belly Taco; Chewy Chips with Summer Fruit Salsa; Street Corn Salad; Chocotorta. You don’t have to be stuck inside to enjoy a fancy steak dinner during the summer. Bring the experience outside while you learn all the tricks of the trade that the steakhouses use to create your elegant dinner in the comfort of your own home. MENU: Grilled Shrimp Cocktail; Marinated Caesar Salad; Grilled Asparagus with Lemon Bearnaise; Loaded Baked Potato Salad; Florentine Steaks; Grilled Fruit with Cheesecake Cream. Take a trip to a French bakery without leaving the city. In this class, you’ll learn how to create bakery-quality confections sure to bring joie de vivre to your next party. Tapas are the heart of Spanish dining where everyone congregates together for good food and conversation. Create your own evening of small plates and one-bite wonders that you can recreate for your next get-together. MENU: Bacon Wrapped Dates; Citrus Olive Salad; Potato and Serrano Croquettes with Romesco Sauce; Gambas alla Plancha; and Churros with Spicy Chocolate Sauce.